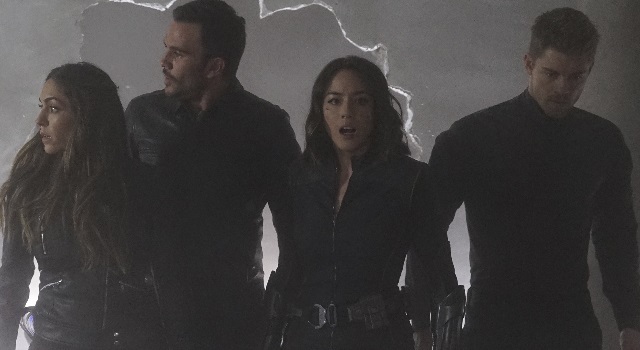 After the events of last week’s episode, Daisy assembles the Secret Warriors in this week’s Agents of S.H.I.E.L.D. which ends up being one of the show’s biggest hours that matches up with what the show did in “Turn, Turn, Turn” all the way back in Season 1 through Captain America: The Winter Soldier. While I have mixed feelings with the assembling of the Secret Warriors, I will start out by saying that my love for Yo-Yo grew so much in this episode that I hope, no matter what happens towards the end of this season that she comes back in a bigger capacity next season. Before we learned that someone had been swayed by Hive, the presence of the Secret Warriors almost made the show feel like a completely different one. Seeing Mack and Yo-Yo continuing to develop their relationship was also really neat and that is why it was so sad that the episode that brought the warriors together was also the same episode where they fell apart. It became obvious very early on that Daisy was the one that got under Hive’s control for many reasons, including how odd Daisy kept talking throughout the episode. In addition, it was always inevitable that something was going to happen with Daisy through Hive, although I never imagined it would have been like this. I also couldn’t imagine that Lincoln would actually had been put in that position after how much he has had to prove to Coulson lately. Besides, what would Hive have needed with Lincoln, who never really had many interactions with Ward, as opposed to Daisy? The scene where Lincoln figures out that Daisy was the one that Hive got, was one of the more heartbreaking moments of the episode. It also gives Chloe Bennet something new to do on the show with this character which will be fun to see over the next few weeks. Even though it’s not cool that she got swayed by Hive, at least she did me a huge favor which was taking care of Malick once and for all. As I have mentioned in previous reviews; while I don’t have any issues with the actor, the writing for this character just made Malick a boring and unnecessary antagonist. Especially as we now have Hive and to be honest, Malick always just felt a forced character to bring in, just because he had been part of the original S.H.I.E.L.D. world council in The Avengers. So while he died at the hand of one of our heroes under someone’s mind-control, I’m just glad Malick is done. Then there is the final moment, the big “Holy Marvel” event where the show was able to take it to the next level compared to what “Turn, Turn, Turn” did. The biggest difference between this episode and that major game-changer from Season 1 was that this time, the show didn’t need a movie to affect the series in a big way. It was able to do something on its own which is a huge accomplishment in my book. I pretty much got the chills from seeing Daisy using her powers to destroy the base, while also stealing a bunch of Terrigen Crystals, as well as getting her theme song in that “corrupted way”. “The Team” had been teased as being a game-changer and it didn’t disappoint at all, other than the quick fall of the Secret Warriors that I had been so stoked to see come together. However, this could be a great opportunity to give Lincoln the chance to lead the group as they try to save Daisy. Overall, this was a really well done episode for not just this season, but the series as a whole as we are now in for an intense ride in the next four weeks. Agents of S.H.I.E.L.D. airs on Tuesday nights, 9/8c on ABC.